oUF layout with many PvE-oriented features and a few options. Features include aura filtering, dispel highlighting, threat highlighting, incoming heal bars, display of all secondary resources, totem timers, cast bars for player/pet/target, incoming resurrection text, combat feedback text, AFK timers, and smoothly updating bars. Mouse over the frames for more detailed health and power text. Hold Shift out of combat to temporarily disable aura filtering and see all buffs. Some elements auto-adjust based on role (healer, tank, damage). Type /pouf for options, or browse to the oUF Phanx panel in the standard Interface Options window. Supported units: player, pet, target, target’s target, focus, focus’s target, party, party pets, arena enemies, and bosses. Raid frames will not be added; use Grid or another raid frame addon of your choice. Supported plugins: oUF_MovableFrames, oUF_SpellRange, and any plugin which does not require explicit support from within a layout. Also Clique for click-casting. Note that you must install the oUF core addon separately. Post a ticket on GitHub or post a comment on this page. If you are reporting a problem, please read this first. If you want to change something that does not have an in-game option to change, you will need to modify the addon's Lua code yourself. If you need help modifying the code, do not post here. This page is for support of the official version only, and tickets/comments asking for help with code changes on this page will be deleted. Post in the oUF forum instead. If you are using a modified version of oUF_Phanx, do not post here. This page is for support of the official version only. Reproduce the problem with the official version first, or post in the oUF forum instead. Works in all languages. Translated into Deutsch, Español, Français (partial), Português (partial), Русский (partial), and 简体中文 (partial). You can add or update translations for any language on the CurseForge project page. Includes an updated copy of oUF -- the official version will not work! The aura filter lists for most classes were compiled using Wowhead. Please report any missing buffs/debuffs (with their ID) or any buffs/debuffs that are included in the default filters that don't actually need to be shown. Thanks. So, did anyone managed to fix those issues? Is there anyway to show what am i casting on castbar? How can I change font size? Siphon Life (Talent) and Unstable Affliction were not showing on the unit frames. More might be missing but those were the big two I've noticed since I main affliction. I added them to Auras.lua with the following spellIDs: Unstable Affliction - 233490, 233496, 233497, 233498, 233499 (covered multiple copies of UA); Siphon Life - 63106. Just a heads up on this part. Last edited by sunsmoon : 08-13-18 at 07:55 PM. I love this oUF more than anyother and i hope to use it for the rest of Legion and for BFA in my main UI. Hoping that you are able to update this soon. Pretty Please. Hey, I installed this addon today, and i've loaded it up for every class just fine... except for the shaman. When I log into my shaman, I get no unit frames at all, and this error comes up"
it works just fine on the other classes (well i haven't tried a rogue, cause I don't have one). I haven't gone in and made any edits to any of the files, I just installed it through the curse addon. This seems to imply that the game is (1) failing to load the config module and either (2a) not giving a reason or (2b) giving a reason that doesn't have a corresponding explanatory label. ... or if no reason is given at all, then the text "no reason given" is displayed. Save the file, reload your UI ("/reload") if you're already logged in, and try to open the options again. What do you see now? Hi. I've enjoyed your work in the past and just recently came back to playing. After I installed your addon and went in game I got this error when trying to go into the options. Thanks for your hard work!! Thank You very much, I tried this edit yesterday and everything works great! The simplest way is probably to open Frames.lua and delete the section under "Aura icons" that creates the aura elements on the frames. I really appreciate the style and the simplicity to configure this unitframes. (*temporary) = "attempt to index local 'bar' (a nil value)"
statusbar = "Melli Dark Rough"
font = "PT Sans Bold"
I hope this to be useful. 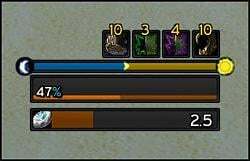 In addition I would like to ask if it's possible to turn off all auras from the addon in some way (lua config files too) because I use raven to track player target tot focus etc with bart instead of icons and that would be redundant. Thanks for your attention and your time. Blue is absorbtion shields, green is incoming heals, but they shouldn't be overflowing out of the health bar. I'll have to look and see what changed in oUF to figure out what needs to change in the layout; I don't actually play WoW anymore, so the latest update was based on (1) reading the oUF changelog and (2) logging in on a trial account on one class to check for obvious errors. I also see in your screenshot that DK runes are buggy, unless DKs now have 10 runes instead of 6. Last edited by Phanx : 02-09-18 at 03:16 AM.